Aikatsu! – 02 | Mezashite! Alright, we made it to episode 2! Ichigo and Aoi finally make it to Starlight Academy, but they face a new challenge already?! And what, there’s going to be more males than just Ichigo’s little brother? Well, you’ll just have to watch and find out for yourself. And as promised, here’s version two of episode 1 as well. Edit: Haha, you know what’s funny? As a new group, I’d say that we’re expected to make some mistakes, but our most recent one in regards to muxing was rather embarrassing. If you were seeing ugly fonts or having issues, then get the newest versions of each. If not, then there were no changes to the script, so don’t worry. Also, the patch for episode 01v2 only works if you have all the fonts already, so we suggest downloading v3 if they didn’t work originally. Sorry for the inconvenience. Thanks as always for the subs. Thanks! And don’t worry for the v2 xD It’s a common error. Any chance you guys will be uploading this on XDCC bots in the future? 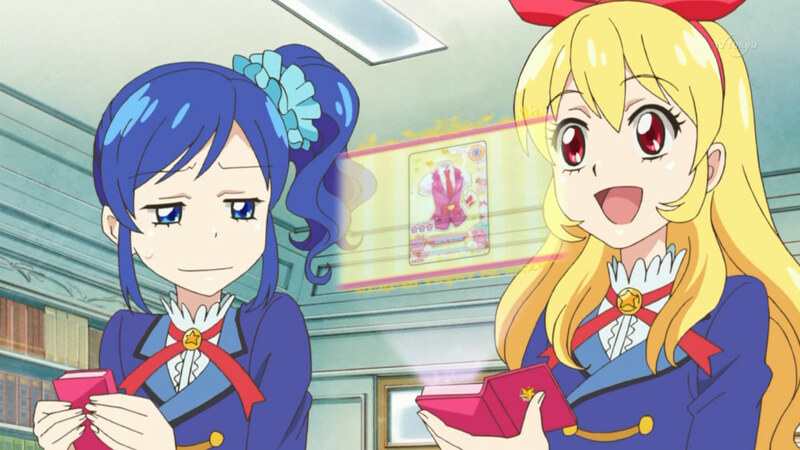 Hey I just wanted to let you guys know that there is no 100 % seed for Aikatsu 2 its stuck at 99,8% and nobody gets to finish it. Oh and of course thx for subbing this show. 2v2 is currently stuck at 99.8% – better seeding would be appreciated. Thanks for subbing this. You guys are already doing a lot better than multiple established groups. I don’t know if anyone else is having this issue, but when I play this on VLC it cuts out pretty bad. Like, the vid will end completely due to having lost data I suppose would be a way to put it. When I played it on Windows Classic, there is a visible skip. I haven’t torrented it and have downloaded it from an off-site. I let them know, but they told me it might be here that I should say something. But meh. Is anyone else having this issue? Official solution: don’t use VLC. I recommend MPC-HC. Unfortunately, we’re also not responsible for any troubles you might have downloading it from non-torrent sources. I don’t have issues with downloading it; it’s the fact that there is some missing data. I’m not sure what’s going on, and I don’t think getting a new way to view things would help. VLC is supposed to play anything. If VLC can’t play it, that’s what Windows Classic is for. I’ve done my research and know what I need to view certain animes. I don’t mean to sound like I know everything and that this is the only way to watch anime or what have you. I’m wondering why I should waste my space with MPC-HC when I have two viable clients to watch what I want to watch. I would hate to drop this series. It’s so good. I love the music; I love the anime itself; I love the characters! The outlook of this anime is good especially if they use more than one song. You are a great subgroup too. Very few straight out of the bulwark can do something like this. I am thinking it’s on the other end. The corruption of the file I mean. I have talked to them and told them about some of the issues stated, I will torrent it from here and see if I have any issues. But that means I have to wait a week for me to be able to watch each episode as they come out. It’s worth it. I will let you know if I find any more issues, doubtful from what I see. The video comes with a checksum (in the file name). Run this on it and see if it says the file is intact. If it’s not, then the problem is with the off-site (which site, by the way?) and if it is, then it’s a problem with the player.